I'm a bit late on this, but now, as part of the great BBAW, it's time to talk about the reason I love book blogs the most: the book recommendations they bring my way. Specifically, the ones I would never have picked up otherwise but that I absolutely loved and can't imagine having never read. Today we encourage you to blog about a book you read only because you discovered it on another book blog. Preferably, this will be a book you loved! You might also write a bit about the blog you discovered it on! Funny! A possible suggestion of future romance (dude, this is how my mind works -- I make predictions based on 27 words)! A twitching body! A mystery (Why is he twitching? Why is he almost dead? Why is the narrator so flip?)! In other words, a hell of a hook! I stared at him, not quite taking in the fact that he had just collapsed at my feet. He lay, curled like a question mark, his evening suit ink-black against the white marble of the floor. He was writhing, his fingers knotted. Obviously, I had to continue. And I did. I laugh all the way to the bookstore is what I do. Then I just settle in and read. It was one of her posts that inspired my Top Ten Kick-A** Heroines of YA post and that's really when I started getting serious about "this blogging thing." Thank you so much, Leila! Simone Elkeles’ Perfect Chemistry is a teen romance full of clichés, melodrama, an unrealistic denouement, and a completely over the top epilogue. And I freaking loved it. Ate it up with a spoon like it was an ice cream sundae. Mmmm. There was no way I was passing this one up. Particularly given how I trust Trisha's reviews. She is extremely upfront and honest about a book. She lays it out for you and I can always tell whether or not it'll be one for me. Such an appreciated quality in a reviewer. And sure enough, Trisha came through again not long after with her review of Printz Award-winning Jellicoe Road. When she said it's not a book for everyone but that it's a book that demands your attention and that she loved it? I buy the book. I do not pass go and I do not ever experience buyer's remorse. What a beautiful, beautiful book it was. Thank you, Trisha! And what post about blogs I love would be complete without a shout-out to my beloved Ana and Thea? (No kind of post is the correct answer, in case you were wondering). It's difficult for me to express the mighty crush I have on The Book Smugglers. Fortunately for me, it sounds like the feeling is mutual. I go to their site for humor, for romance, for kick-a** urban fantasy and scifi, and basically anything else I need in a given 24-hour period. From their nonsensical weekend polls to their deliciously long and insightful joint reviews, I am riveted. Taking notes. Nodding, laughing, talking-to-the-computer-screen enjoying myself. It's thanks to these two that I went ahead and picked up the Kate Daniels series by Ilona Andrews. Based on Thea's double feature review of the first two books (and the glowing Patricia Briggs quote on the cover), I jumped into Kate's crazy, psychedelic Atlanta headfirst. I fell in love with Kate from the word go. I ate up the world-building and was cautiously optimistic about the Beast Lord Curran. When each book got exponentially more mind-blowing, I was hooked. The most recent installment, Magic Strikes, is shockingly good and this series is easily in my top three favorite urban fantasy series. I also followed the Smugs' recommendation and gave Linnea Sinclair a shot, thereby falling in love with Games of Command. Sinclair is to space opera what Eva Ibbotson is to YA historicals. You know what to expect and you can absolutely count on her to deliver a good time. As Ana said, "Not a single one disappoints." 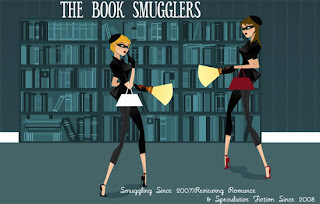 The same can be said of The Book Smugglers. They are made of awesome. End of story. You seriously can't NOT love that first paragraph of SITG!! Did you see the painting a reader did of Brisbane a while back? She posted the link on her blog. And thank you so much for the award! All excellent blogs which I subscribe to but it sounds like I need to stop lurking! Natasha, definitely delurk! They're so worth it. Re: painting of Brisbane-- you know it's funny. When she first linked it I said, "hmm. Not bad. Not quite how I picture him." Then I reread the books and looked again.... mmmmmm. Yeah, that works for me! This is a great post, Angie. You gave a real feel for your "personal book pushers". Britt, I know! The more I look at it, the more I love it. Thank you so much, Angie! To be on the same list as Bookshelves of Doom, which was also one of my gateway blogs? Made my week. Thanks again. Trisha, I'm so glad! Thank you for all the good recommendations. Angie, I just now saw this post -- as usual, I'm way behind on my blog reading -- thank you so, so much!